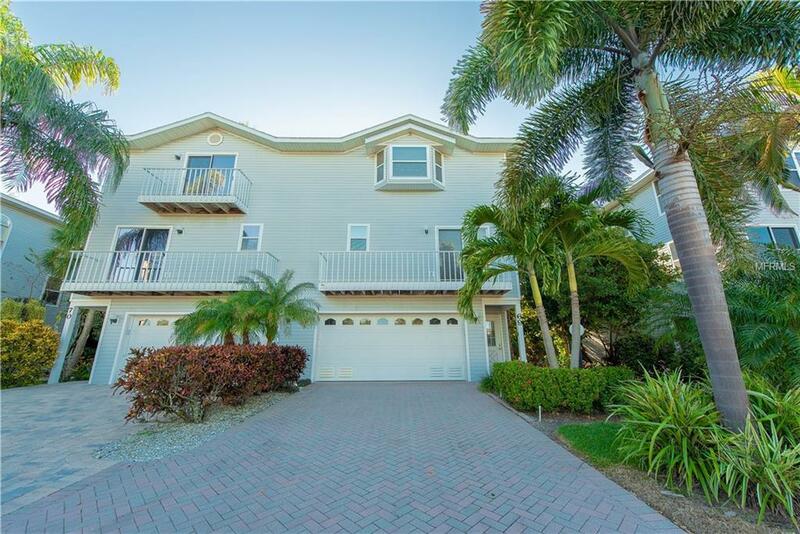 Beachy, bright, and updated private townhome waiting for its new owner! Enjoy your morning sitting on the large, screen enclosed and covered back porch overlooking the peaceful pool. The communitys many trees filter the direct sunlight but many windows keep the property full of natural light. This elevated home offers a 2 car garage, large storage room, playroom, and covered deck on the first level. A stairway goes off the back porch to the deck or pool area. A huge family room, dining room, kitchen with breakfast bar, stainless appliances and solid surface counters, half bath and laundry room on the main level (plus two porches), and 3 bedrooms and 2 full baths on the 3rd. This model is the largest in North Beach Village and has the kitchen that opens to the family room, the most desired floor plan. In the family room, enjoy the cold evenings sitting in front of your fireplace! This area of the community offers you privacy and lack of dust from the shell road, plus there is a pavered driveway. Used as a vacation rental in the winter months, this property has brought in an average of $27K over the last 2 years, and has over $20K on the books already for 2019. The owners occupy the property from May to November. (so rentals could be more). Low HOA and insurance are a huge plus! Roof replaced Dec. 2007.Rental and pet friendly. No size restrictions on pets. North Beach Village is a very desirable community. A great place to live or vacation! Additional Water Information There is A Public Access To The Gulf At 65th St. The Street That Borders North Beach Village To The North is 64Th So Very Close. You Can Use Walkways Through Complex To Go Through Nbv Hoa On 64th To Go To Beach. Additional Lease Restrictions See Condo Docs. Pet Restrictions No Size Restrictions. Pick Up After Pets And Walk On Leash Per City Law. See Condo Docs.